So i just started playing this today. Took a while to figure things out but I think I've got most of it down. I do still have a couple questions though. First, what is the difference between Divisions and Clans, and how do they work? I see something about unique exteriors like Arpeggio in a settings tab in port. How do you obtain these? Finally, is there anything in particular I should try to obtain early on? Should I upgrade lower level ships? Is it even worth it? Or would it be smarter to save my XP/money for higher level ships? I prefer the idea of long range combat as opposed to close engagements so I kinda want to try a battleship ASAP. Save all your Free XP as if you were a chronic hoarder. Save it. Save it. Save it. As to the game, don't just spam the battle button as you will want to. Stay in the battle a bit and observe who is doing what we'll. Oh look that ship is using the island as cover and shooting over it. Look that BB is nose on to his threat, not sideways. And look that BB is using the WASD keys so kindly provided for by the computer manufacturer. Most (if not all) of the things here are long gone and you can't get them now, but maybe in the future for some of them. They are usually special items given out through a series of missions or challenges, or through collections. Try several lines, and take them out to tier IV. If you want to snipe in a battleship you most likely won't find success, because it's more important to be helping your team push. Some good lines that I enjoyed (my opinion, maybe not yours) were German battleships, Japanese battleships, American destroyers, Japanese cruisers, and soviet cruisers. Clan is a group of players that group together under one tag and can earn bonuses and participate in clan battles and so on You see them in games in brackets (Like mine is [SYJ]). A division is when you partner up with 1 or 2 other people (from your clan or not) and all go into battle together. Welcome! Arpeggio were unique skinned ships (IJN) that are no longer available. I would save your money and free exp for higher levels. After tier six things start to get expensive. Battleships are certainly good at long range combat. They’re slow, and their captains need good map awareness so they can be in position to support their team. Good luck and have fun! Division is a group or party that you can pick up and drop at any time. Clan is well a clan, Guild, Fleet, Battalion, Sector, Platoon; whatever you want to call them, they are a large group of people that can work together and can provide small benefits for just being in one. Some event camos can change a ship's exterior and you can earn when they come around, its unsure if the ARP ships will be earnable again though. If you want to try long range you could give Japanese Battleships, French and Russian cruisers, or Russian DDs a try. What is the level requirement for a clan? BBs aren’t snipers, learning that early will help you win more, at lower tiers, many couldn’t hit a barn from the inside (it gets substantially better later on though). BBs are meant to push flanks where the enemy is weaker, many cruisers have too weak armor to push in. Cruisers do have the maneuverability to stay at range and doge. Which in the early game is what one should do, in late game, or if BBs are pushing, then be that force multiplier. DDs are the team players, they can do either job depending on the line to an extent (gunboats kite away, and torpedo boats spot and wreck stuff with torps). They either kill other DDs or spot the enemy force. CVs, oh boy, easily the hardest ships to play in the game, especially when you get manual attacks at T6. They wreck stuff without being hurt, they spot, they support flanks. CVs are very demanding, and many are very salty when their ships aren’t the priority to save from air strikes. Don't remember...sorry. Pretty sure it's one of the higher ones, 12-15. As a new player, Welcome!! Have fun and enjoy yourself. I think all of you questions are mostly answered. However I will leave you with this, it has lots of good information that will help you out s you learn how to play. Don't have to figure everything out right away. But knowing where to go to find stuff out is nice. If you have any other questions, let us know. Personally I wouldn't rush into the higher tiers just yet. Play a bunch of different type of ships Tier 4 and when those become easy or fun move up to Tier 5. I found iChase most useful as a noob, and Flamu when I got more experience, The Mighty Jingles helps with basics and is entertaining. 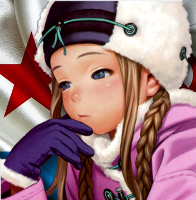 Yuro is good too if you run on limited time, but only good for a few ships. Because the Arpeggio ships were a licensing agreement w/ Arpeggio Blue Steel which expired in Dec 2016, it's unlikely you'll get a chance to receive these ships again in the future for legal reasons. On the bright side, because the "neon look" of these ships were skins rather than cammos, they were slightly downgraded ships in concealment than if you were to cammo your Tech Tree/Premium Kongo, Myoko or Atago. The skins prevented you from ever using cammos on these ships. As a potential development, if you are at all interested in the High School Fleet (HSF) ships, you may want to pick them up when you get the chance. This, too, is a licensing agreement that probably won't run indefinitely. I want to unlock the South Carolina. Can I research it with the XP I've earned with Erie or do I have to purchase the St. Louis? I was able to research the St. Louis without buying the Chester. I have about 2,000 XP for the Erie and the tech tree says the S. Carolina costs 3,120 XP, but when I click on it, it says it costs 4,820 and that I need 3,991 more XP. The tech tree has been the most confusing part for me so far. There is an XP "path" to reach the next ship tier. This path is best seen in the module view for each ship. If you wish to bypass a tier, you still must pay the XP necessary to research the path through that tier. 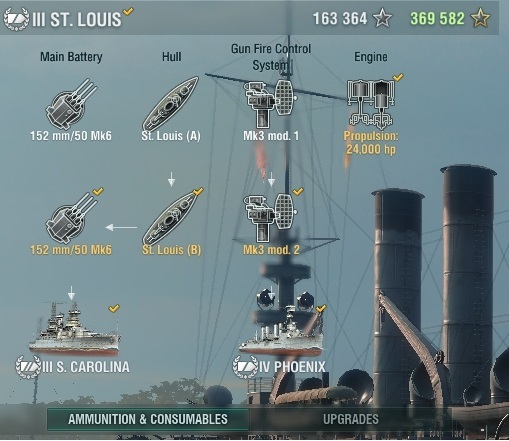 If you attempt to research the SC and skip the St Louis, then the XP to research the path through the St Louis is added to the research cost of the SC. As there are some modules that are not on the path, you don't have to pay the full equip XP to skip a tier, but you stil lhave to play whatever XP is required to run the path through that ship tier. And if you skip the Chester too, then that path's XP will also be added. I would not advise skipping ships at first. Once you have enough experience in the game to have a grounded idea of what you are doing, sure, but at first you should play through them to learn. Also, play all types, Cs/CLs/CAs, DDs, BBs and CVs, at least a little to understand their goals, strengths and limitations. But I have already researched the St. Louis and the Chester. I just haven't bought them. Does the XP requirement still stack unless you actually buy them? I already got a couple of tier 2 ships and a destroyer - Soviet (I should have went for a different nation since USSR has no battleships). I just really want to try out a battleship. IDK if I'll like it or not, but I do plan to get used to the different kinds of ships before going to higher tiers. 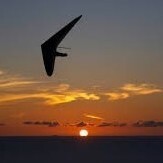 Look at the St Louis modules. There is probably an additional module or two on the path to the SC. You need to XP those modules to get you to the SC. It is this XP that is being added (i.e., those modules are being researched) when you try to research the SC directly. Edit: Pic added. You need to research St Louis (B) and the 152mm Mod to get to the SC. You would need to research Mk3 mod 2 to get to Phoenix. The research cost for these mods are added to cost to research the SC (or Phoenix, respectively), if you have not otherwise researched them. Is there any way to unlock new slots to store ships without buying them? And either way, what is the maximum amount of ships you can have? If I sell a tier 1 ship that I started with, does it cost money it buy it back? Is there a WoWS Discord sever or something? Cruisers don't typically have 4-6 second reloads. That'd be a decent DD RoF however. If you have rhinotillexomania play battleships, otherwise cruisers and destroyers are way more fun. They may be somewhat fragile and challenging but very engaging and rewarding in terms of entertainment. Seriously, there are many good suggestions above. Depending on your situation, purchasing premium time will assist you greatly in earning silver and FreeXP. I encourage you to not go too fast to get down the lines as it will probably only frustrate you the higher the tier. FreeXP is really good for getting past the stock ships as some of them are painful. But I have already researched the St. Louis and the Chester. You generally want to save that for unlocking modules on ships, because it's harder to come by, (you get 5% of your match XP awarded as free XP) and can be used for anything. Just think of the new ships as another module to unlock. Is there any way to unlock new slots to store ships without buying them? Yes, you can get them occasionally in daily containers. Sometimes you'll earn free ships, and they come with a slot. If you don't like the ship, sell it and use the slot elsewhere. I've got almost 40 ships, played since OBT, and haven't purchased a single slot. And either way, what is the maximum amount of ships you can have? There's a couple of them I think, somebody will know the address.